3.8 out of 5 based on 75 bloggers and 16 commenters. 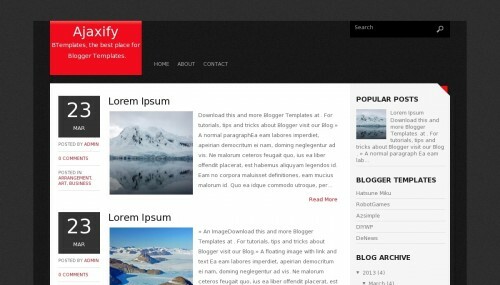 Ajaxify is a free blogger template adapted from WordPress with 2 columns, right sidebar, footer columns and posts thumbnails. I liked a lot this template, but I just can’t make it fit at my blog, and the tools of the templates panel shows me a message saying that they’re not avaluable for this template. There’s anything I can do about? (I don’t understand pretty much (close to nothing) about CSS and html). why the date undefined ? too bad this is the most impressive one I have seen. It’s not a template issue. Go to Settings > Time / date > change “Stamp” to a date that is ordered Day, Number, Year. Sorry, maybe I am just not seeing it, but I did change the time stamp for nearly a thousand times – and same result as mentioned above. Hi there, thanks for the template, I’m trying it out in my site and looks really nice :)I like having the complete posts instead of the “Read More” style… is there a way to remove this? also, I would like to have a bit more space in between posts, what css property should I be looking for? thanks for the awesome job, cheers from buenos aires! If you know how to solve this it would be greatly appreciated. Hello, this is a great template, but on the left side under the big date the links “Posted by”, “Posted in” and “comments” can not be edited, why? If I press on them I go on uncontrolled web sites. Please, someone has any idea?